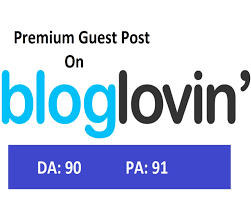 I can create Bloglovin Permanent guest post. Recognised as one of the safest and genuine SEO techniques, Guest Posting/Blogger Outreach is essential to create brand awareness & online visibility. Opt for it and fulfill one of the most desired and challenging part of SEO – To Get Quality Back Links.